Sign-in to your Twitter account. Go to the profile page of the user you want to mute. 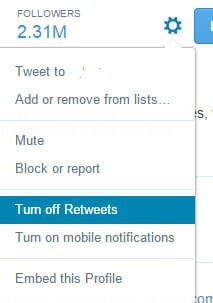 Click on the gear icon on the profile page > Turn off Retweets. Retweets from the selected user will no longer be displayed in your timeline! Published by deri58. Latest update on January 8, 2019 at 02:56 PM by स्वर्णकांता. This document, titled "Twitter - How to turn off retweets from a user ," is available under the Creative Commons license. Any copy, reuse, or modification of the content should be sufficiently credited to CCM (https://ccm.net/).